It was by chance that I came across trendhim website and I am glad that I did. The items I purchased i was searching for but could not find anywhere except for rubbish. Shaving brushes are an indispensable part of the classic wet shave. Use the filters to find the brand, or type of bristle you are looking for. You can read more about the types of badger hair at the bottom of this page. Of course we ensure a full warranty and easy return policy. Shaving brushes play a major role in traditional wet shaving, which can be done with straight razors, safety razors or Mach style blades. Whatever shaving implement you prefer to shave with, it is important to properly prepare your skin prior to shaving. shaving cream or foam that one uses. It helps to provide a close, comfortable shave with less skin irritation. All of our brushes have been selected for the quality of the bristles, their balanced weight and the shape of their handles. A shaving brush can last for many years with proper maintenance, including how it is dried after each shave. Pure Badger Hair / Pure badger hair is usually the least expensive. Its name refers to what part of the badger the hairs come from, so in the case of Pure, it means the hairs come from anywhere on the hide. Because those hairs are so plentiful, they are thus the least expensive of all the badger hairs. 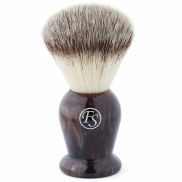 Often, Pure badger shaving brush hairs are trimmed in a curved shape that makes the hairs stiffer. This not only makes it easier to build up a good lather it also helps exfoliate the skin. Finest badger is the best quality badger hair you can obtain along with silvertip hair. The difference between them is that the silvertip hair is softer than the finest badger hair. Finest badger hairs are selected from the rare, longhaired badgers and are highly prized and sought after by experienced wet shave enthusiasts. Both kinds of bristles will provide you with long lasting shaving brushes with solid crowns of badger hair. Best Badger Hair / Best badger hair is a significant improvement over pure badger hair. Best badger hair is harvested uniquely from the badger's stomach. These hairs are more absorbent than pure badger hairs making lathering up easier, so they make great shaving brush bristles. Super Badger Hair / Super badger hair is somewhat softer than Best hair and it is harvested from the back of the badger. Super hairs usually have that characteristic dark middle section colour pattern. Super hairs represent the highest quality bristles you can get in a shaving brush. Silvertip badger hair/ Silvertip badger hair is one of the most uncommon and most expensive badger hairs one finds in quality shaving brushes. They are strictly harvested from the neck of the animal where the softest hairs are found. Similar to Super, Silvertip hair is characterized by the sharp transition in colour from dark to light. Silver tip hairs have superb absorbency and must be treated with care.